This category will include what I find in the back rooms of the signboard artists studios. These were not commissioned by me, but they were certainly snapped up by me! 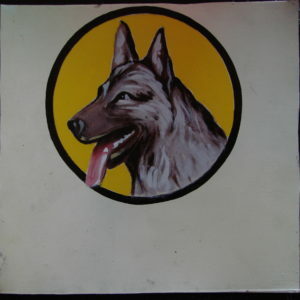 This vintage Beware of Dog sign is hand painted on metal and is over 20 years old. I found it near the Chabahil market in Kathmandu. I traded it for a new sign, so that there would still be Danger Dog signs in the area. The patina: though it was outdoors, it was placed under an overhang and spared water and sun damage. It was not spared some governmental graffiti and there is some paint chipping near the German Shepherd’s right eye, and on his tongue. When they repainted the door where it was placed, there was paint spattered onto the edges. 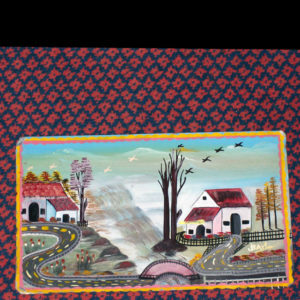 Also by Ramesh of Om Art, I found this little landscape while digging for vintage Beware of Dog art. At 8’x14′, this small piece packs a lot of info into a small painting. The best of Nepal is included in this outsider piece, including the flora and fauna, mountains, charming homes. It also includes the fantasy of well marked highways with not trucks or trash. This painting has no lettering and hence is perfect for you to customize. 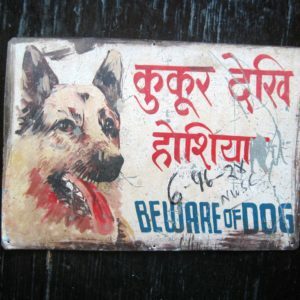 I found this at the Surya Studio in 2007 and was charmed by this classic Nepali beware of dog sign. I recently found one just like it on a gate in Kathmandu not far from Surya’s studio. It is a beauty. I believe it to be painted by the artist Hari Prasad. This Springer Spaniel is not technically vintage at all! 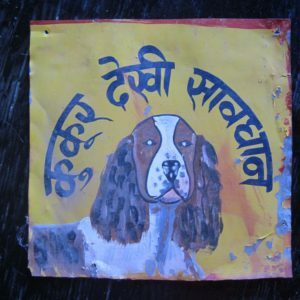 It was hand painted by Santosh Shrestha for a hotel in Pokhara, modelled after a Springer Spaniel that he had done for me in 2007. But it looks vintage. He did not prep it as he would do for my commissioned pieces. Still, that patina looks great. If I were to buy this, I would add a clear coating to preserve its present condition.